Although we generally value youth over maturity, having more birthdays is a good thing. The British Royal family traditionally sends birthday cards to subjects on their 100th and 105th birthday, and every year thereafter. How we celebrate a birthday depends upon whose birthday it is and the culture they belong to. A party and gifts are a common practice. In some cultures, rather than bringing presents to the birthday boy or girl, the birthday celebrant gives gifts to their friends and loved ones as a sign of thanks for the love and support received during the past year. As unusual and even unfair as this seems to us if you have a wide circle of friends there is a good chance that you will be attending another birthday party every couple of weeks, so it evens out. Naturally, you will not be sending birthday presents to historic figures when you celebrating their birthdays, but the occasion is often a national holiday. America's first President and Revolutionary War Hero George Washington's birthday is February 22. Abraham Lincoln birthday is February 12. While Lincoln's birthday was not listed among the national holidays, he was a popular enough figure that several states listed the day as a legal holiday. The two celebrations are often combined as Presidents' Day and celebrated on the third Monday of February. The Great Gildersleeve celebrated George Washington's birthday by making it a day of total honesty, with hilarious results. George Washington's Birthday is also celebrated on Fibber McGee and Molly, The Jean Shepherd Show, Quiz Kids, Thirty Minutes in Hollywood, and Cavalcade of America. Because birthdays are such a universal experience, they are great material for scriptwriters to work with. We want the people who are important to us to feel special on their birthday, and one way to do this is to through them a birthday party. If situation comedy writers are to be believed, the most special party of all is a surprise birthday party. The same writers also show us that a surprise party is rarely a wise idea, although Gracie was able to pull it off for Grandpa's 92nd birthday on The George Burns and Gracie Allen Show. Fibber is much too smart to be caught off guard by a surprise party until the gang throws him one down at the Elks Lodge. A more interesting question is whether he has the wits to surprise Molly on her birthday. 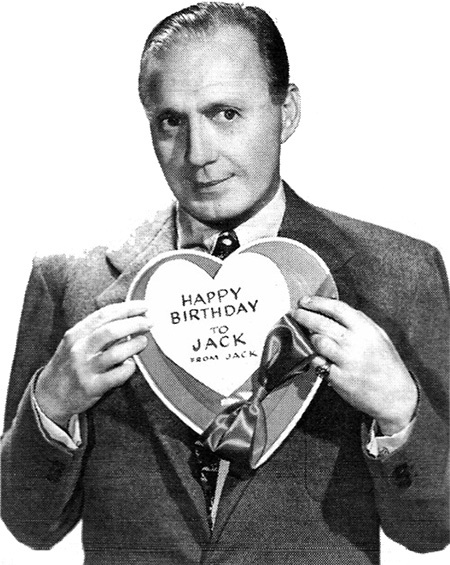 For OTR fans, Jack Benny's birthday, which occurs on February 14, Valentine's Day, is almost as important as George Washington's. One of his show's running gags was that Jack's vain character would never admit to being over forty. Born in 1894, in 1937 Jack admitted to being "in the neighborhood of thirty-five". The punchline in 1946 was that Jack was turning 37 for the third year in a row. By the time Jack turned 39 for the first time in 1948, he was actually 54! There was some dispute whether Jack was 39 or 40 in 1954 when he, in fact, turned 60. 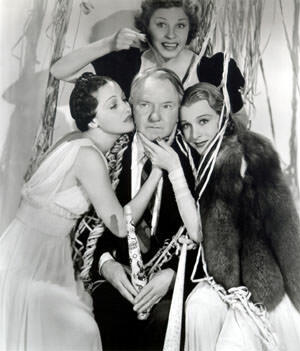 Jack also celebrated other birthdays on the show, including that of his vocal group The Sportsmen in late November, and Dennis Day's birthday in mid-January. Like Jack, some people see birthdays as a reminder that they are getting on in years and losing their youth. At the same time, if a loved one forgets your birthday it can be devastating. That is why Clifton Fadiman gets laughs when he asks the panel on Information Please to name their wives birthdays. On One Man's Family, Pinky forgets his best girl's birthday even though his brother had sent her a birthday card. It seems as though the whole family has forgotten Chester's birthday on The Life of Riley, in fact, they have made a contribution to the CARE organization. Earlier, Chester has to throw a Sweet Sixteen party for daughter Bab's and on wife Peg's birthday, he has to take her to see the musical South Pacific. Part of a successful surprise birthday party is getting the date, which can be difficult for someone with a tenuous grasp of situations like Irma, she is convinced it is Jane's birthday on My Friend Irma. Margie does a much better job for her father on My Little Margie. Along with a party, presents are another important birthday tradition and can be even more difficult to get right. Why else would Phil even consider fitting his fourteen-year-old daughter for a deep-sea diving outfit on The Phil Harris/Alice Faye Show? Sometimes, the best gift is time together, otherwise, there is no way that Chester would sit through South Pacific with Peg on The Life of Riley. On two different occasions, Fibber decides the nicest thing that he can do for Molly's birthday is to cook for her, which, as questionable as his efforts are, turns out better than when he delivers real presents on Fibber McGee and Molly. 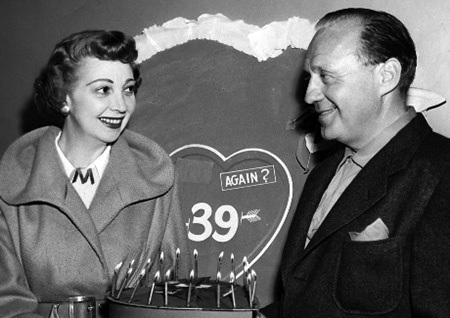 Being a family man, The Great Gildersleeve was no stranger to birthdays. This isn't always a great thing for Leroy, especially when Gildy helps his classmate Ethel Hammerschlag to have a happy birthday. There is a bit of justice when Craig Bullard doesn't invite Leroy to his birthday party. Conflict arises when Gildy's new love interest invites him to a birthday party on the same day as the Baby's first birthday, the little girl who he found in the back of his car and raised until her father got back on his feet. Birthdays are a big deal in Wistful Vista (Fibber McGee and Molly) as well. One year, Fibber bakes Molly a cake, another year he tries to throw her a surprise party and another he is determined to bring her breakfast in bed. For Fibber's birthday, there are plans for a surprise party at the Elks Club. We have plenty of other birthdays to celebrate in the collection, including William Shakespeare, Winston Churchill, Franklin D. Roosevelt, George Washington, Jimmy Durante's nose, George Cohan, Grandma Moses, Shirley Temple, and many, many more. Judy's plan for a perfect day for Mr. Foster's birthday on A Date With Judy. Henry buying a bracelet for Kathleen's birthday on The Aldrich Family. Discovering that April Fools and Dagwood's birthday fall on the same day on Blondie. Gracie planning a surprise party for Grandpa's 92nd birthday on The George Burns and Gracie Allen Show. Charlie McCarthy spends his birthday arguing with W.C. Fields on The Chase and Sanborn Hour. On The Jimmy Durante Show, Jimmy's nose gets its own birthday! A birthstone ring premium from Ovaltine is part of Little Orphan Annie's birthday party. Hilarity ensues on My Favorite Husband when George confuses Liz's birthday for his mother's, a classic Lucille Ball situation! Even Clark Kent gets a birthday on The Adventures of Superman in syndication on March 9, 1942. If it hadn\'t of been for OTRCAT, my great library of otr would not exist!! OTRCAT will always have my business.